Whip up your own fresh batch of butter with this butter churner, packed with recipes for flavored varieties. What could be more quaint than a batch of butter you churned yourself? In a world where even bananas can be bought pre-peeled, pretty darn quaint. 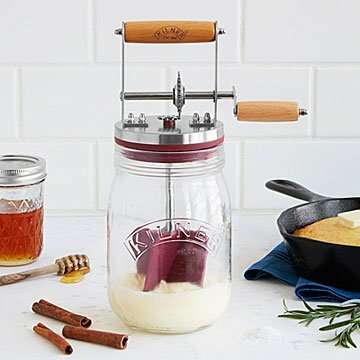 Packed with a basic butter how-to along with several flavored butter recipes, this butter churner features all the components you need to whip up a fresh addition to your breakfast spread. Pour the whipping cream into the churner, turn the handle, and enjoy a fresh batch of butter. Made in China. Click here to learn how to use your Butter Churner. A (very funny) member of the UncommonGoods team tested out our Butter Churner. He even made chocolate butter, droool. Read his write-up on our blog. Glass base is dishwasher safe. Wash the butter churner head in soapy water and leave it to air dry. Always ensure that the churner is completely dry before storing. Very simple and easy to make fresh butter, especially good if you like herbed or salted butter. Be careful of the lid though, I picked it by the top and ended up with a mess - keep it firmly on a counter while using. We love real butter, so making our own is awesome! This product is awesome! You get your money's worth! Delicious butter in just a few minutes. A great learning experience for our whole family aged 4 to 76. A fun, old-fashioned kitchen tool in a useable size. will flow op on this review when I see the product used. Butter Churner makes a unique, inexpensive gift! I made holiday butter pats with my grandchildren using chocolate candy molds. Easy for little ones, and easy clean-up! Perfect 30-minute kitchen project! Fun easy activity to handmake butter! We used it to make homemade butter for Thanksgiving - it was a fun easy activity for everyone to particpate in with the churning. This little gadget is surprisingly efficient and fun to watch butter form in a few minutes. I make two batches, one for remaining the best sweet butter (unsalted), or adding honey or cinnamon to, and one for adding a touch of Himalayan salt and garden herbs.